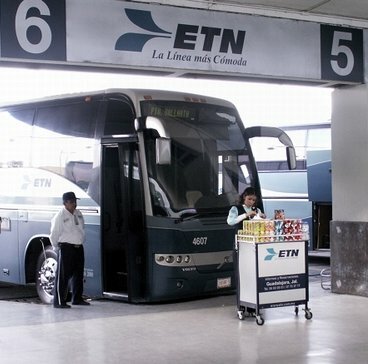 Links to Mexican bus companies: Bus routes, bus schedules and prices. www.ticketbus.com.mx - A good site for buying tickets for central and southern Mexico (in English). I have never liked cars. I don't like to drive and I don't feel safe in them. I like having several tons of steel in front of me for protection. Besides that, on a bus you can sleep, talk to people, read, watch the scenery, and watch movies. It is really quite entertaining. People hop aboard and sell food and other things. On occasion even musicians come on and play a few tunes. On my first really long trip (36 hours) my friend told me "Oh, it will be fun". And it was.... kind of. Besides that, public transportation is better for the environment and you don't have to pay those high gas prices. 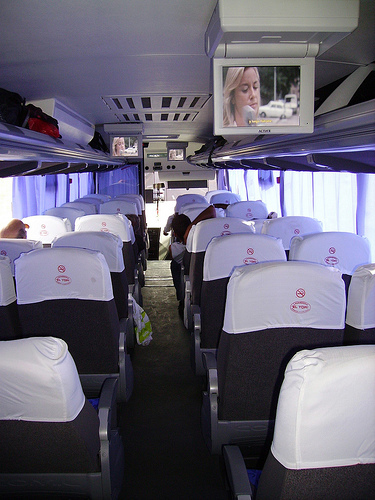 The long distance buses in Mexican are quite luxurious. Forget the chickens. For some reason the idea of chickens on Mexican buses has survived 30 years past its demise. They now have air-conditioning, reserved seating, reclining seats, music, movies, and bathrooms. Some even have coffee bars and give you a bag of food when you get on. Executive class is the best but they don't have it for all routes. TAP, Futura, Omnibus de Mexico and ETN are a few of the better lines. The only downside for me is that they show movies throughout the day - usually action films - the old Arnold Schwarzenegger type. A nice nap is constantly interrupted by the sounds of explosions and machine guns. For your comfort is it best to bring earplugs, eye shades, a small pillow and a light blanket or sarong. Be sure to bring socks and a sweatshirt as it can be quite cool with the air conditioning on. Also, bring magazines, a good book and healthy snacks such as apples, carrots and nuts. The buses stop every 2 or 3 hours so you can get out and stretch your legs. When you get out, ask the bus driver how long you will be staying there. (cuantos minutos). They may stay anywhere from 5 to 45 minutes so you can use the bathrooms and get a snack or meal. The restrooms are generally clean and cost 2 or 3 pesos. The snacks at the bus stations are very expensive - sometimes double the normal price. They also make special meal stops at roadside inns where you can get a full meal - carne asada, chicken etc. The buses run frequently. Along the stretch from Tijuana to Guadalajara there is probably one every 10 minutes. To get from point A to point B you usually have to go to a hub city like Guadalajara. The Lonely Planet guidebook has the bus schedules and tells you how long each trip takes along with outdated prices. Try to plan your trip so you arrive at your destination during the day - preferably early in the day to get a good hotel. Another great thing about Mexican buses is you generally don't need reservations. You can go whenever you want, any day, any time. An exception to this rule would be during Semana Santa or Christmas. The word for bus station in Spanish is "camionera central".